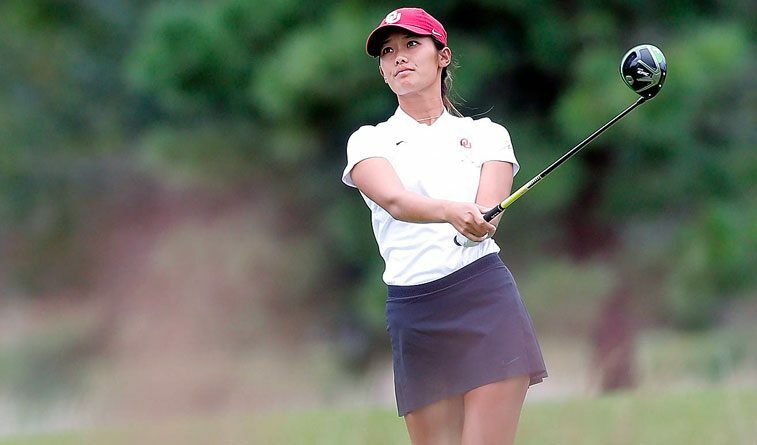 Oklahoma women’s golf team is tied for fifth place after playing 36 holes on Sunday at the Jim West Challenge in San Marcos, Texas. The Sooners fired a 292 (+4) in the morning round before improving by six shots in the afternoon with a 286 (-2) at the 6,185-yard, par-72 Kissing Tree Golf Club. Oklahoma’s 36-hole score of 578 (+2) is three stroke out of the top three in the 15-team event. TCU leads the field with a 567 (-9). Freshman Mikhaela Fortuna, playing in the Sooner lineup for just the second time, is tied for 12th after firing a 71 (-1) in both rounds. Sophomore Kaitlin Milligan is one stroke back, tied for 18th with a 143 (-1). Senior Julienne Soo opened the day with a 4-over 76 before bouncing back with a 69 (-3) in the second round. The senior is tied for 24th at 145 (+1). Freshman Libby Winans is tied for 37th with a 148 (+4) and sophomore Sydney Youngblood shot a 153 (+9) to sit in 58th. The Sooners conclude the three-round tournament on Monday at 8:30 a.m. CT with a shotgun start. Live scoring is available on BirdieFire.com.